Advances in science and technology throughout history have facilitated major transformations in warfare. The rapid development of information and communication technology over the past few decades is a case in point. Precision guided munitions and remotely controlled aircraft have made military interventions more surgical yet more ubiquitous. Outer space and cyberspace have created new opportunities and vulnerabilities, thereby adding whole new dimensions to conflict. At the same time, the international law framework dealing with the use of force has not changed much. With 29th Helsinki Summer Seminar the volume 25 of the Finnish Yearbook of International Law (FYBIL) offers a forum for discussing whether and how international law can deliver on its civilising and humanising promise in the face of profoundly changing means of warfare. Those interested in publishing an article in the “Law, War & New Technology” special section of FYBIL volume 25 should submit a manuscript by 30 April 2017. The manuscripts should not exceed 15,000 words in length including footnotes unless justified by the subject matter. In public international law the concepts of sovereignty, territory and jurisdiction are often seen as inextricably linked. 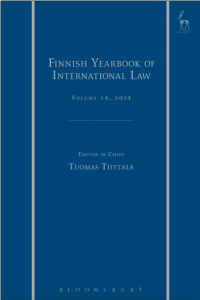 The forthcoming special section of the Finnish Yearbook of International Law of 2015 seeks to offer a forum for discussing the relationship between these complex concepts. The aim is to analyze how these concepts affect and have affected our understandings of international law. In order to investigate the underlying assumptions, the Special Section hopes to bring together a wide range of views from not only international law but also from political theory, geography, philosophy and history of international legal thought. Those interested in publishing an article in the “Sovereignty, Territory and Jurisdiction” special section of the Finnish Yearbook of International Law should submit a manuscript conforming to the FYBIL house style by 16 October 2015. The manuscripts should not exceed 15,000 words in length including footnotes unless justified by the subject matter. The guidelines for authors interested in contributing to the next issue are to be found at the link below. Please read through the document carefully. Despite its unquestioned importance for political, social and economic development as well as its wide application on both national and international levels, the understanding of the concept of the rule of law remains disputed. Numerous attempts to define its content and requirements have resulted in the emergence of various competing conceptions of the rule of law, significantly affecting its application in concrete situations. Is it possible to determine the meaning of the rule of law or does it remain essentially contested? Those interested in publishing an article in the FYBIL special section should submit script conforming to the FYBIL house style to the editors by 15 October 2013. The length of the paper is at the discretion of the author, however, it should not exceed reasonable limits.